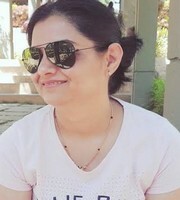 Poornima Laxmeshwar is a content writer for a living. Her poems have appeared in Cold Noon, Vayavya, Muse India, Writers Asylum, The Aerogram, Stockholm Literary Review, Northeast Review, Brown Critique, Cafe Dissensus amongst many others. Her haiku, haiga have found space in several magazines.